A bevy of smoked goodness is available at Heritage Meats' Hayden shop. The sign outside Heritage Meats says "Farm to Table." That's important to Rob Egusquiza and his brother, Yon, who started the Hayden, Idaho, retail shop on the corner of Government Way and Honeysuckle Avenue last fall. "If we don't make it, we go find it," says Rob. In addition to local beef, pork and lamb — by the pound, packaged, and even precooked — Heritage Meats features regional products ranging from honey and jams to wine and beer. "I'm always trying to get people's product in who aren't able to get their product out there," says Rob. Originally from Boise, the Egusquiza brothers relocated to the Hayden area while in their 20s. Yon attended the University of Idaho, while Rob started Hull Hog Farms in Tonasket, Washington, with stepbrother David Howard. 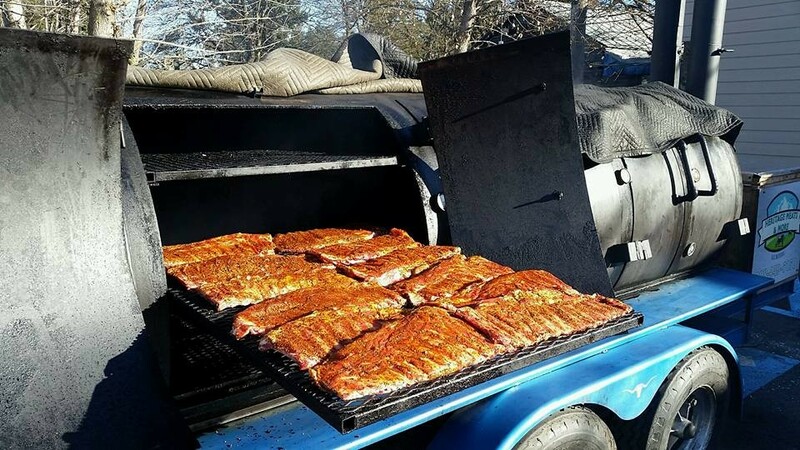 Hull Hog supplies the nearly 30 pork items on the menu: chops, ribs, bacon, jerky, sausage, ham and even smoked hocks. With their on-site smoker going Wednesdays through Saturdays, Heritage has added lunch specials, like a smoked pork sandwich with chips ($7) or flanken-style short rib sandwich ($8). You can also order smoked meat to go, along with filling your growler with regional beers. Home cooks will appreciate row upon row of rubs, sauces, seasonings and accoutrements for any kind of meat and heat-tolerance level. Egusquiza is particular about his sources. The pork from Hull Hog, as well as beef sourced from Okanogan ranches neighboring his farm, are antibiotic and hormone-free. His pasture-raised pigs are fed on non-GMO barley fodder, while the beef is either 100 percent grass-fed or grass-fed and finished on non-GMO grain. Once you've gone whole hog with this type of business, doing custom orders is no sweat. Heritage can get you a quarter to a whole side of beef and half a pig or whole lamb, and they're even considering a delivery service. Heritage Meats also sells lamb from Montana, eggs from Outlaw Farms in Post Falls and cheese from Brush Creek Creamery in Deary, Idaho.